Altered letters add a special touch to any room in your home. Altered letters are a fun paper craft project that can be used to add a creative look to your home. Altering wooden letters is a simple way to design unique home accents. You can decorate a child's room with his or her first name, add your last name to the entrance of your home, or make a clever monogram to personalize your mantel. Altered letters also make interesting holiday decorations. For example, you can make a frosty blue "Let it Snow" for winter or a red, white, and blue "Freedom" display for the 4th of July. Altered letters also make great handmade gifts for a wedding, anniversary, or baby shower. Before starting the project, note the colors used in the gift recipient's home, then design coordinating letters that will become a cherished keepsake. Altered wooden letters are wonderful craft ideas to sell for those who are interested in beginning their own home-based business. You can make several generic words and phrases, then take custom orders for names and monograms. If you enjoy card making, rubber stamping, scrapbooking, or other paper crafts, you probably already have many of the supplies needed to begin altering wooden letters. Many craft stores such as Hobby Lobby and Michaels Crafts also carry kits that contain everything you need for altering letters. Trace the letter onto the back of your patterned paper. Use sharp scissors and/or a craft knife to cut out the letter shape. 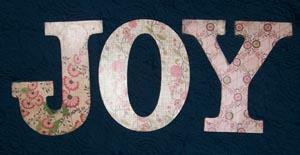 Use Mod Podge and the foam paintbrush to adhere the patterned paper to your letter shape. Smooth out any air bubbles with a popsicle stick. When the Mod Podge is dry, add family photos if desired. Lightly sand the letter with fine grit sandpaper to get rid of any rough edges. Add a bit of brown or black ink to the edges of your letters to give them definition and help conceal any small mistakes made during the cutting and sanding process. Seal and protect the letters with a coat of Mod Podge. When Mod Podge is dry, add ribbon, charms, flowers, or other dimensional embellishments if desired. When they are finished, altered letters can be leaned against the mantel as a display. However, if you wish to hang your letters, simply add ribbon ties or hanging brackets to the back of each letter and position them on a wall. If you are having a hard time completing the altered letter project, consider an easier craft using wooden blocks. Simply purchase a wooden block and decorate it with stenciled letters that spell out the word or saying of your choice. Since the blocks are perfectly square, they are much easier to cut and trim. Wooden blocks are also very versatile, since you can use the different sides to spell out various word combinations or make a themed photo display.